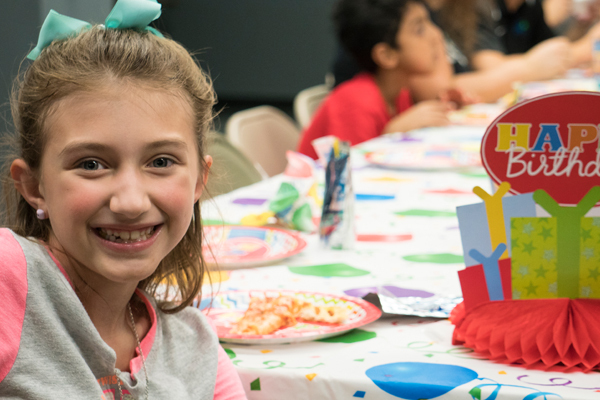 NJAC is the perfect place for your child’s next birthday party! Host a pool party, celebrate with field day, become a superhero, or even cheer and tumble. Our themed parties are sure to make your celebration one to remember! What comes with your party? Birthday Parties are 2 hours in length, and include 1 hour of activity and 1 hour in party room. (An additional hour can be added for an extra fee). Base price includes groups of 15 children. (Additional guests are $15 extra per child). Two birthday party hosts will be assigned to run each party. 2 slices of pizza and 1 juice box per child are included with your party. Paper Products: plates, napkins, tablecloth, utensils and cups are also included in your party. All attending parents will be granted complimentary access to the fitness facility while the event is in progress! Splash Down: Pool Party! Swim, play, and splash the day away at NJAC. We’ll set up relay races, games and dons of fun for your special party all year round. Field Day: Make your birthday just like field day! We’ll set up relay races, tug-of-way, and other fun challenges to make everyone feel like a winner. Sports Zone: Get in the zone with your favorite sport. With a variety of different sports to choose from, including: indoor soccer, basketball, flag football, extreme dodge ball, and more, there is sure to be something for any future All-star! Superheroes to the Rescue: This superhero party will have the kids’ running, rolling, and jumping to superhero status! With a variety of fun games and activities that will activate the kids’ ‘super powers’, everyone will leave feeling invincible! Ninja Warrior: This high-flying, action-packed party will allow children to unlock their inner ninja. This party will include obstacles courses, upper body strength challenges, and agility training that will have the kids in ninja warrior shape in no time! Cheer and Tumble: Get excited! This birthday party comes packed with energy and spirit. Learn to cheer and tumble with the best! Have an idea you don’t see here? Feel free to reach out to us by completing a Birthday Inquiry Request Form and we will see if we can make it happen for you!